One on-duty member initially responded with HAZMAT 8, Monroe County's Hazardous Materials Truck, while two more subsequently responded on Rescue 5. As off-duty Firefighters arrived at the airport firehouse, Rescue 9 was attached to the AFFF foam trailer and two more members responded to the scene. 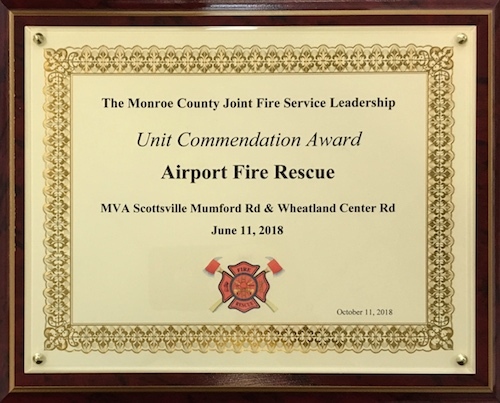 Additional off-duty members responded to the firehouse to maintain staffing on the airport and prepare to deploy any additional resources that might be requested. On Monday June 11th, 2018 at 8:14am, the Mumford, Scottsville, and Caledonia Fire Departments along with CHS ambulance responded for a report of an MVA involving a Fuel Tanker Truck and a Medical Transport Minivan at the intersection of Scottsville- Mumford Rd and Wheatland Center Road. The incident quickly escalated as the initial units were dealing with one serious patient that required transport and a fuel leak from a tanker truck that was carrying both gasoline and diesel. The tanker truck was off the road and on its side. Specialty resources in the form of a Level 1 Hazmat and a request for foam resources from the Greater Rochester International Airport and the NYS OFPC Foam Trailer operated by the Rochester Fire Department were also dispatched to the scene. This incident was ultimately mitigated over the next 9 hours by transferring the product out of the tanker truck to a secondary vehicle. This activity required firefighters and Hazmat personnel to drill two access holes into the respective compartments on the tanker truck to access the product via a “ stinger operation” which was needed in order to accomplish the transfer prior to “righting” the truck. All of the on-scene units supported this operation by assisting with water supply, rehab, logistics, planning, possible fire suppression, and related command and control functions. This incident was unique as this was the first time that the Monroe County Hazmat team had performed this type of operation outside of a training environment. They were also assisted by members of NYS Office of Fire Prevention and Control that enhanced the overall coordination of this effort. The initial responding agencies should be commended for addressing immediate life safety concerns, conducting a good size-up, and requesting the appropriate resources required to safely mitigate an incident of this complexity.